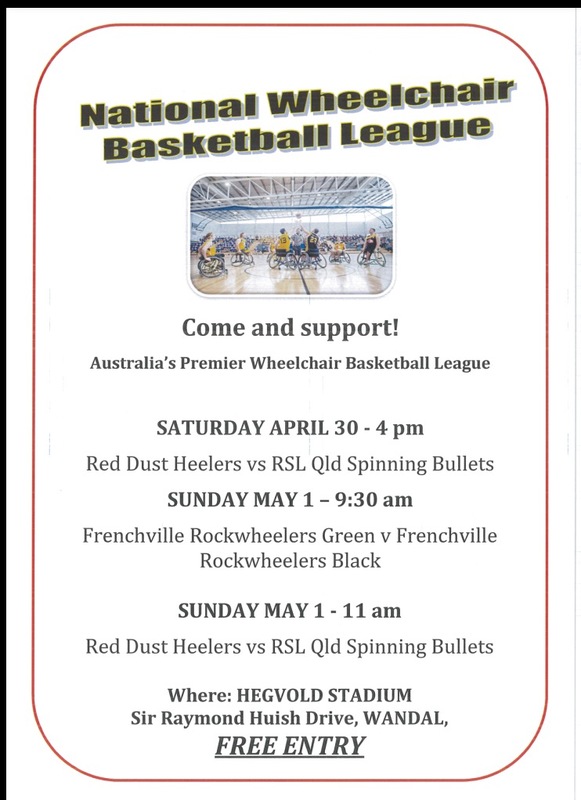 A big congratulations to The Rockhampton Rockwheelers, Rockhampton Sporting Wheelies, and the Frenchville Sports Club who have partnered to be bring a National Wheelchair Basketball League game to the Rockhampton public. On Saturday 30th of April the Red Dust Heelers will play host to the Brisbane Spinning Bullets in the first ever National Wheelchair Basketball League game in Rockhampton. The game will tip-off at 4.00pm at Hegvold Basketball Stadium (Harney Court), with game two set to tip off the following day on Sunday 1st May at 11.00am. Not only is attendance to the National League Games free but players from the Red Dust Heelers will also be holding a number of free community engagement events. Download the attached document for the full run down of events. THE Frenchville Rockwheelers have rolled all the way to State Championship glory, undefeated and triumphant. After nearly 12 months of preparation, a core group of players from Rockhampton and Gladstone held off quality competition to take out 2013 A-grade State Wheelchair Basketball Championships, at Brisbane’s Boondall Entertainment Centre recently. The team of Luke Christie, Jason Holohan, Rod McPherson, Ben Lodewikus, Todd Anderson and import player, Western Australia’s Shaun Norris dominated competition from across Queensland to sail through the round-robin competition undefeated during the two-day tournament. They then went onto win the semi-final against Brisbane’s Icemen team 47-44, before claiming a grand final victory against Brisbane’s Dream Team, also by a slim three points. “The competition was high, and it was very, very close,” Rockwheelers’ coach Jenny Anderson said. Anderson had been in charge of the Rockwheelers for the past two years, and said she was very proud of the guys, and the wheelchair basketball program in Rockhampton. “I think we had an edge over the other teams because we’ve been training really hard, we play well as a team, and everything came together well over the weekend above and beyond what we expected,” Anderson said. Most teams featured one or two National Wheelchair Basketball League players, and Norris filled in the role for the Rockwheelers, adding guidance to the other team members and lifting the standard of play, Anderson said. Meanwhile, three Rockhampton juniors – Ben Lorimer, Cory Lawton and Keagan McClusky – were selected for the Queensland junior team, which also competed at the state championships. The Rockwheelers are the current medal holders for the Northern Wheelchair Basketball Challenge, and Rockhampton will host the next round of the challenge.